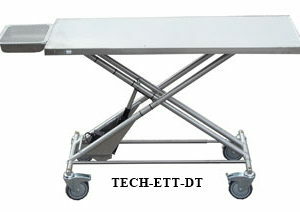 Lowest Starting Position of any Lift Table Available- Only 4″ Compared to 12″- 18″ for the Competition! Animal Can Easily be Walked onto the Table without Being Lifted. All Polished Stainless Steel Construction. 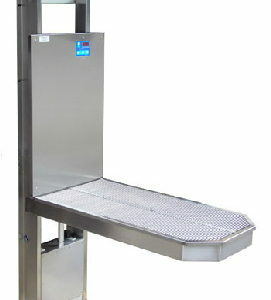 Includes Digital Weight Scale- Usable in all Positions in Lbs. or Kgs. 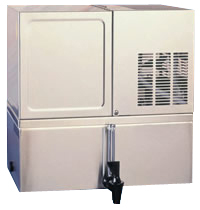 Hydraulic Power Unit is Self Contained Inside the Frame of the Lift Table. 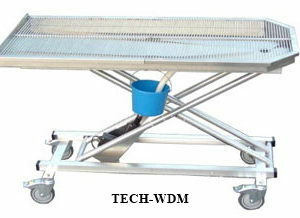 This Permits the Table to be Lowered 4″ without Remote Mounting the Power Unit. A Technidyne Exclusive! 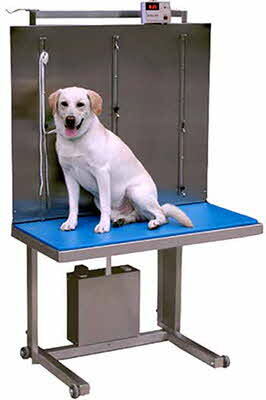 Animals are Held Secure with Patented Sliding, No-Choke Elsam Restraint System. No Spill Table Top- Will Not Leak or Drip on Back of Table. Extra Electrical Outlets Mounted on Back of the Table for Clippers, Exam Light, etc. · Table has a Built in One Piece Back to Prevent Liquid or Foreign Matter from Being spilled. A Technidyne Exclusive!